What do you get when you brew a double strength stout with some Intelligentsia La Tortuga coffee beans and Willamette hops? Heaven in a glass. Goose Island Beer Company of Chicago, Illinois brews a series of Bourbon County Brand stouts and releases a unique coffee version each year around November with a different brand of coffee bean. 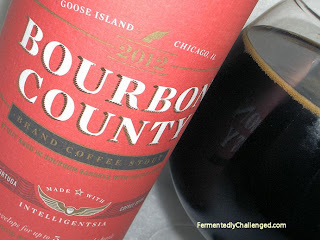 This review is of their 2012 edition of Goose Island Bourbon County Brand Coffee Stout. I had the pleasure of sampling this a couple of times earlier this year at the Big Beers, Belgians & Barleywines Festival in Vail, CO last January and it was one of my favorites from that fest. I was already a big fan of their Bourbon County Brand Stout, but with the addition of coffee, this brew becomes something totally different and unique. Goose Island was kind enough to send me a full bottle of the 2012 edition of this beer made with coffee beans from the Caribbean for me to review and I could hardly wait to revisit this beer. Bourbon County Brand Coffee Stout is a monster of a double stout. It weighs a hefty 14.3% ABV and a big 60 IBU. It only comes in 22oz bottles (or on draft if you are lucky to find it). This beer is brewed at the original Goose Island brewery in Chicago, Illinois. Despite the fact that this company is now part of the AB-InBev family, this beer should still be considered to be brewed by a craft brewer. True, AB-InBev here in Colorado makes some of the Goose Island beers here locally which may not be considered "craft", but this one is still brewed only at their original Chicago craft facility and is considered one of their best beers. Goose Island states that this beer will mature very well up to 5 years after bottling. 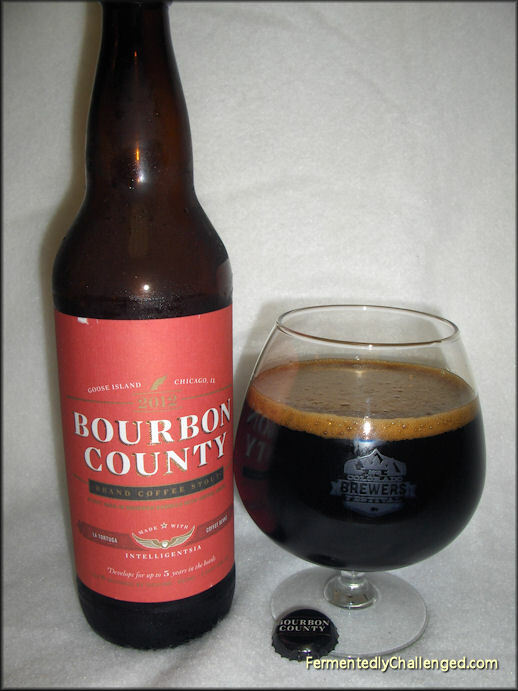 Appearance: Goose Island Bourbon County Brand (BCB) Coffee Stout poured out thick and nearly black with a small dark brown head. The head seemed to be fizzy sounding, and it disappeared fairly quickly. The brew was so dark that even along the edges it still remained very dark. Swirling the beer in the snifter glass left little lacing, but raised a small head back up easily once again. For a stout, BCB Coffee Stout was about as dark a beer as you can find. There seemed to be some liveliness in this beer from the carbonation, a bit odd for a double stout. Aroma: Here is where BCB Coffee Stout really shined. In a word: Heavenly. It's one of the richest aromas in a beer I've ever smelled. Normally, when I sniff a dark stout I get lots of dark roasted malt and a hint of chocolate. Here I got that plus a whole lot more. The coffee aroma was an eye opener. There were also whiffs of chocolate and perhaps a bit of dark fruit in the nose. It's the type of scent that I could smell again and again and never get tired of. The aroma intensifies as it slowly warms. Do yourself a favor and let this beer breathe and warm up a bit. Sure, you'll also notice a hit of alcohol in the nose too, but the coffee, chocolate, toffee and roast in this beer far outweighs the higher ABV. Yes, there is a bit of hop in the nose too, but it takes a back seat. This beer was meant to be sampled from a snifter glass and swirled. Only fill the snifter about 1/3rd full and it's nearly perfect. Taste: Oh yes! Very few beers make me fall in love from the first sip, but this is one of them. This is a big, rich, thick and chewy stout. It has a big coffee taste, but is not acidic like some coffee beers can be. There is an underlying chocolate sweetness about it as well that in my opinion makes this beer outstanding. Yes, you can definitely tell there is alcohol in this brew, so tread slowly. This beer had a big thick and creamy mouthfeel too. At some point, I was briefly reminded of the complexity of a Sam Adams Utopias, but at half the alcohol. Once a beer gets beyond a certain ABV level it begins to take on a different feel. Other imperial stouts fall way short of being complex and tasty, but Goose Island seemed to add so much more to this. The coffee really makes this beer so much more flavorful without being dry or acidic. As this beer warms the flavors become more intense. Don't drink this cold right out of the fridge, rather, let it warm and the flavors really start coming out. Overall: Awesome! But a word of caution - this 22oz bottle was made for sharing. If you attempt to finish an entire bottle by yourself you will get seriously tipsy. You've been warned! Share this one and savor it in 4-6 oz quantities for best enjoyment. Even consider pairing this with a rich dessert or even over ice cream. Consider using a snifter glass and sip this one slowly. It's well worth slowing down for as you'll want to savor each sip. If you spy a bottle or two of this beer grab them both quickly as you'll want one for now and one for aging. Even though I sampled this beer in the heat of summer it was wonderful. I can imagine that this beer in the winter would be even better as a warmer. If Goose Island is remembered for one thing, it'll be their Bourbon County Brand stout series. One of the best beers around and for you stout lovers - this is high up on the list. Disclosure: This bottle was sent to me directly from Goose Island Brewing Company as a complimentary promotional sample. I was not paid to do an endorsement, rather an open opinion of this beer. - Goose Island Bourbon County Brand Barleywine Ale review. - Goose Island Christmas Ale 2009 review.